Celebrating more than 57 years of service to S gauge! 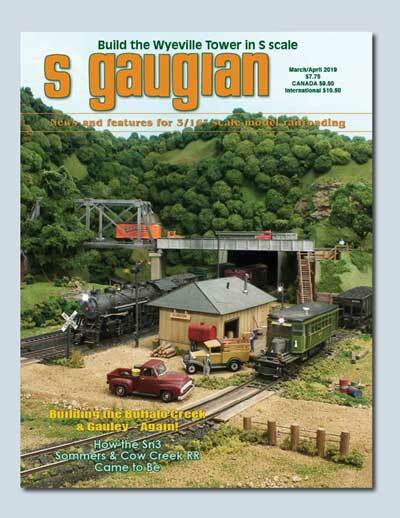 The S Gaugian is the S gauge magazine! Great scale and hi-rail photos and feature articles in this bi-monthly publication serving all aspects of S, including collecting and operating American Flyer, scale, hi-rail, kit building, scratchbuilding and more! Subscribe to the S Gaugian! A subscription to the S Gaugian is $41.00 a year (6 issues); $75.00 Canada; $88.00 elsewhere. Sample copy is $12.50 ppd. You can subscribe by calling us with a Visa or MC at (708) 366-1973. You can also email us at info@heimburgerhouse.com or send a check to S Gaugian, 7236 W. Madison St., Forest Park, IL 60130. If you are interested in advertising in the S Gaugian, download our rate card here. Sn3 Modeler ceased publication with the Fall/Winter 2018 issue, but many back issues are still available. See a list of Sn3 Modeler back issues.